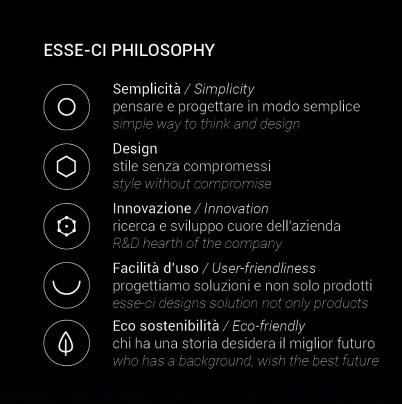 Since 1984 ESSE-CI projects and produces solutions of light Made in Italy. LED’s, state-of-the-art technologies for lighting and the attention to design more and more flexible and original, are since long time the foundation for the development of each lighting solution esse-ci. Today, ESSE-CI represents a benchmark in the market for lighting solutions based on LED technology, standing out for quality and innovation. Design excellence meets high technology electronics; we pride ourselves in developing ever more flexible and innovative products that embrace LED sources. Low energy consumption, high mechanical resistance, long life, accurate thermal management, optimum colour quality, high quality optical control and sustainable product design are all qualities of Esse-ci lighting fixtures that feature LED technology. There are a lot of elements that some companies in the market might not consider, but which Esse-ci measure as an essential part of the product design process; for example photo-biological risk and the chromatic qualities of the LED (LED binning, MacAdams ellipse, etc). Sometimes it is difficult to compare LED products in the market due to differing information published about the products characteristic features. Very often manufacturers quote the LED source performance as an absolute value of the fixture, without considering the inefficiency contribution of reflectors, optics, driver, etc. Customers selecting Esse-ci LED lighting solutions can be sure of proven quality, safety, longevity and efficiency.